Love them or hate them, teleconferences are a part of the modern business landscape. Barely a week, or for some barely a day passes without them joining a teleconference. Often, upwards of a dozen participants are gather together from around the world, at various times of the day and night in their time zone to discuss the latest issue or hold an update meeting. Yet, few things less intellectually or emotionally stimulating than a teleconference, sitting in a sterile office talking to colleagues in other locations who themselves are sitting in similarly sterile offices, or on occasion sitting in hotel rooms, home offices or bedrooms while holding that all important meeting. So many teleconferences become more of a grand standing exercise where one or two of the participants dominate the discussion. These are often the convener of the teleconference or the one from a highly individualistic culture who simply wants to be heard on every subject. Teleconference participants who come from quieter, more reserved and retiring cultures, or those who have the language used on the teleconference as their second language, tend to be overpowered and often just listen to the discussions without adding comment. The great majority of teleconferences are extremely impersonal events. Typically they neither hold nor help develop any sense of relationship between participants, they are simply a number of disembodied voices struggling to hear and be heard. Each participant or group is shut away in a small room, only able to communicate through a plastic box on the desk, with nothing except the tone of voice of the other participants to indicate the level of human engagement in the discussion. As humans, we are social animals and work best in a socially normal setting. Our forms of communication have evolved over millennia to rely on all of our senses to understand and interpret messages. We crave a more tactile form of interaction than what is afforded by a teleconference, we need instead an environment where we can see and fully experience our meeting colleagues. Denied visual cues, we infer through our own cultural experiences what we believe to be the real message, sometimes we get this right but often we don’t. Plus, many high context cultures use silence as part of their form of communication, either to invite others to participate or to emphasise a point, silence on a teleconference does not provide the same level of context and is so often misunderstood. 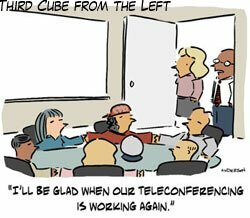 Despite many business beliefs to the contrary, the average teleconference is an incredibly unproductive exercise. During the average teleconference, most attendees spend the majority of their time either listening, trying to hear what is being said or checking their email (and you never know which). This level of passive or even active disengagement from the meeting takes the inefficiency of meetings to a new level. It is generally far better to have 2 or 3 people talk on a smaller and shorter call and for them to then share the outcomes than it is to gather larger numbers on a teleconference. Let those who would only be passive participants in the teleconference do whatever they would be doing if they weren’t needed in the call. Following on from point 4 above, it is so easy to unplug and just drift along with the phone on mute that many teleconferences simply become an excuse or even force their participants into social loafing. A number of organisations use a teleconference as a way for one person to be briefed on events within the business by personnel in many locations. In this format, a highly engaged chair speaks sequentially to a series of largely actively disengaged others, all of these others have to endure a long call for a few minutes of input. This structure and many similar ones are essentially company enforced social loafing, the participants often have little choice but to be part of the call but are only able to contribute for a small part of their time. This situation is particularly hard on participants who need to join the call outside of their normal office hours, either early in the morning or late into the evening, encroaching on personal time and leading to additional fatigue. The global nature of modern business means that it is inevitable that some discussions will need to be held at unsocial hours for some participants. Different organisations work with this time zone pressure in different ways, and realistically there is no simple solution, but also some businesses force the non head office staff to take all of the pain, often holding the teleconference calls during core hours that suit head office, so the other locations have to just fit in. The consideration of local times can also include how changes to daylight saving and public holidays are managed. For instance, sometimes the one hour shift from daylight saving can mean that a meeting suddenly moves to outside of core hours or into lunch time at one location. Equally, a public holiday at one of the non head office locations can easily be forgotten, making the participant spend their public holiday time off on a teleconference instead of with their family. Most teleconferences are like magicians tricks, they give a sense of achievement but in reality little is usually accomplished, they are highly ineffective yet many participants leave thinking they have achieved something. This is usually an illusion since rarely are decisions actually reached on the call, more typically issues get pushed down the track to be regurgitated at the next teleconference or decisions are made offline. The dynamics of a typical teleconference are such that the group is too large, the meeting too unfocussed and the participants only partially engaged. All of these factors are ingredients for a poor, unproductive meeting, yet we keep holding them in the hopes they will get better. Have you been in a teleconference from hell; have you found ways to run your teleconferences that make them into lean mean decision making machines, if so, we would love to hear from you.